The attack in 1998 on the Maritime Union of Australia (MUA) was part of the growing offensive by capital against the working class that continues at an increasing pace today. The offensive by employer Patrick, with the support and collusion of the then federal Howard Coalition government, used the military and police arms of the state in an attempt to force the MUA off the waterfront. In Australia, productivity bargaining, massive reductions in workforces, bench-marking and various other employer-driven measures to intensify exploitation and maximise profits have been foisted on unions. In many instances, there was little resistance and even cooperation for quite a long period of time during the class collaboration of the Hawke-Keating Labor government period. In the eyes of the employers, the union movement was weaker than in former days. Under propagandist banners intended to help force workers to submit to the employers’ agenda, slogans such as “reform”, “world’s best practice”, “competition” and “productivity”, built an environment in which conflict and confrontation were presented as evil and undesirable. Class struggle was to be replaced by “harmonious relations” (class collaboration) between unions and employers. Trade union membership declined sharply in this period. The MUA remained one of the few where 100 percent trade union membership prevailed. 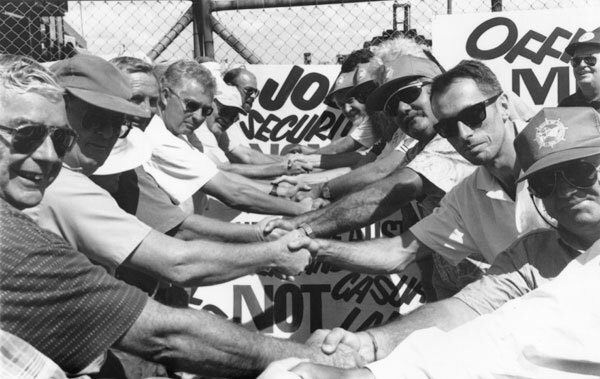 In the 1980s and early ‘90s, there were some serious attacks on the union movement such as Mudginberri, Robe River in WA, SEQEB in Queensland and the Dollar Sweets dispute. In this period, the New Right developed, taking over the leadership of the National Farmers’ Federation (NFF) and coming to the fore in the Liberal and National Parties. Leading New Right figures such as Ian McLachlan, Peter Reith, Peter Costello and David and Rod Kemp went on to become federal government ministers. When Peter Reith became the Howard government’s Workplace Relations Minister, he declared war on the union movement and identified four industries for “reform” and four unions for destruction – meat, construction, maritime and miners. The government and employers targeted what they saw as the strongest points of the union movement rather than starting with the weakest. If they could knock off the strong, the rest, they believed, would be easy. The Workplace Relations Act and amendments to the Trades Practices Act were introduced. Targeting the MUA, the Howard government spent $1.2 million on consultants for advice on how to destroy the union, de-unionise the waterfront and abolish award conditions and all the gains won in a century of struggle. A master plan was mapped out. Patrick Stevedores and P&O (the other major stevedoring company) were consulted and involved. P&O was not prepared to sack its workforce since its large shipping line would suffer from international solidarity actions that would inevitably have followed de-unionisation. But P&O did join in the discussions with the government and then opened a second front in the offensive against waterside workers with demands for massive retrenchments and reversals for the union on the waterfront. The first blow using the new laws was struck against the miners at Rio Tinto’s Hunter Valley No 1 mine. Rio Tinto’s objectives were clear: de-unionisation and individual contracts. The CFMEU Mining Division fought a tactical struggle, avoiding breaking the new laws and preventing the dispute spreading to other mines or other unions. This was a marked change from past struggles in which the principle of “one out, all out” was the norm with other mines taking solidarity actions and other unions becoming involved. These new tactics, adopted in response to the new legislation, caused concern among some union members. However, they trusted their leadership and endorsed its recommendations. These tactics were a response to the new draconian legislation governing labour-capital relations. There had been a shift from industrial law to corporate and common law with Reith’s legislation relegating the Industrial Relations Commission (IRC) with its deliberations taking into account economic implications in its ability to conciliate and arbitrate. Almost all the court hearings in the MUA dispute did not take place in the IRC but in the Supreme and High Courts where the nature of hearings and decisions are significantly different and legal costs are extremely high. The Howard government’s changes put labour-capital relations on a commercial footing, based on the idea of a contract between two parties: one selling labour and the other buying it. The new situation was meant to pit individual workers against their employer. Conciliation and arbitration, which had operated for over 90 years, has been replaced by a system based on injunctions, damages actions, sequestration of assets, fines, deregistration and jail penalties. Unions, their individual members and officials can be sued for millions of dollars and face the threat of losing their homes, their savings – everything. Secondary boycotts, such as solidarity actions by other unions in support of striking workers, had been made illegal such as truck drivers refusing to cross pickets or workers and their unions taking solidarity action. The Workplace Relations Act outlawed discrimination on the basis of union membership or non-membership. This was intended to help employers prevent unions taking action against the recruitment of non-union labour. The Trades Practices Act’s anti-trust provisions – competition law – outlawed what was termed as “monopoly behaviour”. For example, the fact that all wharfies belong to the MUA is alleged to be “harmful, monopoly behaviour” which infringes the law. Employers and the government attacked the MUA’s coverage because it meant workers were not competing with each other when they negotiate industrial agreements. The government argued that there should be more than one union on the waterfront or, better still from its perspective, a pool of non-union labour. This is what the National Farmers’ Federation attempted to create with the introduction of a non-union workforce onto the waterfront. Concepts such as “world’s best practice” and “benchmarking” were other devices aimed at pitting workers in one country against workers in other countries. Arising out of the waterfront dispute, a formidable armoury of laws – industrial, corporate, civil, competition – were put in place to threaten the trade union movement with fines and damages. The MUA faced a choice: to remain within the law and avoid massive damages actions and sequestration of assets or to disregard the new laws and take actions which might be strong enough to defeat the laws – as had happened in the Clarrie O’Shea case in the 1960s. The MUA and the Australian Council of Trade Unions initially remained within the law and confined the dispute as far as possible, much as the miners had. However, they were prepared to widen it and conduct an all-out struggle backed by other unions. Such a situation may have been approaching when the High Court ordered the reinstatement of the Patrick workforce. If the High Court decision had not gone in the union’s favour, the struggle might have escalated and broadened. The ACTU was already surveying its affiliates to see what level of action they were prepared to carry out. Were the MUA tactics the containment of struggle or the correct approach in the current circumstances? In fact, they were not an abandonment of class struggle but the best and most effective way to wage that struggle given the new industrial legislation, the rising but still not high level of struggle in the aftermath of the years of Accord class collaboration introduced in the Hawke-Keating years, the influence of reformist social democratic ideology in the working class, and the current balance of class forces. The new tactics won the re-instatement of sacked MUA members but raised a number of important issues. The nature of the struggle meant that its organisation needed to be centralised. It was not possible to fight such a campaign if each area was making independent decisions. It was conducted nationally, with a consistent uniform approach providing the basis for unity in action and the building of a united front of the MUA and the whole trade union movement. This laid the basis for stronger and effective struggles against the government and employers. The role of the state in the waterfront dispute is one of its significant features. The Howard government had been complicit from the start. It had been planning, driving and organising the attack on the workers and had not hidden its support for Patrick Stevedores. There are close ties between the government, government bodies and the employers. Employment National (formerly the Commonwealth Employment Service) was headed by a former Patrick employee. One of Reith’s staff had links with the maritime industry and government money was used to draw up the strategy for the stevedoring companies. The Department of Foreign Affairs and Trade, the Immigration Department and the Ministry of Defence were complicit in the Dubai affair, where replacement scab workers – mostly former military personnel and ex-police – were secretly trained to take over the positions of the unionised workforce. It would have been impossible to organise in a few days passports for military personnel to travel to Dubai without such involvement. The Department of Social Security through Centrelink had instructions to discriminate against MUA members and their families and report to the Minister any applications they received. They got into hot water when Community and Public Sector Union members objected and queried the legality of their instructions. The government was forced to pull back. State governments were also involved to varying degrees. In Victoria, Jeff Kennett’s Liberal government supplied batons, shields and mace gas for use on the waterfront against wharfies. The role of the police both took unexpected turns and was instructive. The union’s approach was to make consistent efforts to establish friendly and good working relations with the police. Police men and women are unionists. In Victoria, police took industrial action during the MUA dispute and placed bans on attending demonstrations. They quickly won a wage rise. Their union went on to affiliate with the Victorian Trades Hall Council. Of course, if the police force had been given orders to forcibly break up the pickets, they would have done so. The bourgeois state will always use the police and other agencies to maintain its power, by force if necessary. Effective tactics were developed during the dispute. One was “shielding”, another was the idea of “peaceful assemblies”. After injunctions were won by the employers, and MUA officials and members could not continue to organise and lead the pickets, they were shielded, replaced by officials from other unions and volunteers from the community. The use of the term “community picket” or “peaceful assembly” was also used to shield the MUA from the full force of the anti-union laws. It also reflected the broad community participation in the defence of the MUA. Significantly, the people joining or visiting the pickets, bringing donations or sending messages of support came from a wide social spectrum: a section of the farming community, small business people and students as well as workers. The MUA and ACTU leadership contributed to the breadth of support that was developed during the dispute. The community assemblies at the wharf gates were like mini-cities. Morale was reinforced with concerts and other entertainment and events. Regular reports on activities in other ports and on other developments were provided. Delegations of unionists from other areas, plus sporting figures, TV personalities and various politicians paid visits. Meals were supplied with much of the food donated. Telephones were installed and televisions hooked up. Visiting postal workers suggested that the Port Botany picket should be given its own post code. The atmosphere of comradeship, determination and commitment had to be experienced to be fully felt. One woman had taken her annual leave and was living at the picket line in a tent. She had never been on a picket before but had decided she must do something when she saw what was happening to the wharfies. Raising $250 a week for every family of the sacked MUA members was a huge task. In Brisbane, for example, with sacked workers at two ports, they had 247 families to support and 360 children. MUA members still at work struck a levy while members of other unions made voluntary contributions on a regular basis. Financial support also came from many other organisations and individuals. The International Transport Federation (ITF) played a crucial part in the dispute, demonstrating once again the power of international working class solidarity. ITF action nipped in the bud the first attempt to introduce non-union labour onto the waterfront in Cairns; it knocked Dubai out completely. The full impact of the ITF response to Patrick’s use of non-union labour came as the ships loaded by non-union labour moved around the world. For example, the Canada Columbus spent a few weeks on the US west coast where US dockers refused to unload her scab-loaded containers. What were the key issues in the struggle? Two, organisational economic, stand out: union labour and collective bargaining. The aim of Patrick and the government was to de-unionise the waterfront and replace enterprise agreements and the award with individual contracts. Compromise on these would have represented a serious setback for the union movement, resulting in reductions in wages, poorer working conditions, loss of jobs and lower safety standards. But the MUA stood firm on these two questions. Return to a centralised system of deciding wages and working conditions, to collective bargaining and an end to individual contracts. The right to strike without qualifications. Public ownership. The ports and stevedoring operations should be publicly owned and controlled. A shorter working week with no loss of pay. Opposition to privatisation which is killing jobs, robbing governments (and hence the people) of revenue, pushing up the cost of services and reducing quality and access.